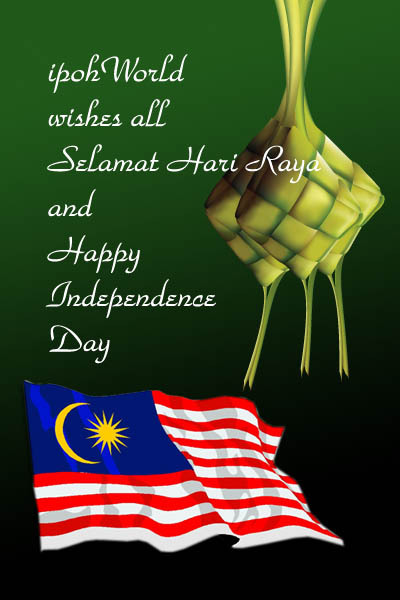 Wish all friends, fans and moderators/administrators of ipohWorld a happy celebrations and holiday. Be safe and drive safely. MERDEKA . .
IT’S ONLY YOU . . . hasbi . . . .
BTW . HAPPY HOLIDAYS . . IPOH WORLD’S WORLD . .
Be Safe and Drive Safely . We at ipohWorld hope that you have enjoyed this double celebration and shared the good times with family and friends. I hope to get around to working on your book collection and others very soon – once I get this book launch out of the way. Please wish family and friend Selamat Hari Raya Aidilfitri fro us.